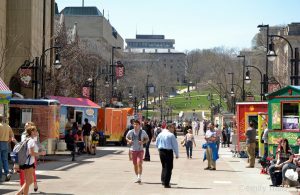 Here are 6 reasons why the food cart spring rolls dominate the lunch scene on campus. Choose one of three proteins (tofu, shrimp, chicken), add avocado, and pick your spice level! Pro-tip: ask to substitute rice noodles with Pad Thai, they will not disappoint. This is easily the most affordable way to takeyourself out to lunch (or breakfast! or dinner!). 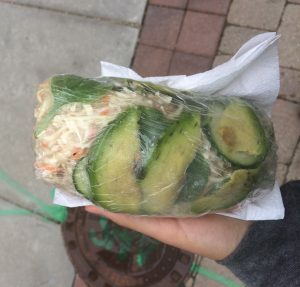 At only $3.5, this sizeable spring roll is sure to satisfy you even at your hangriest. These things are GIANT. This food item is closer to the size of a small baby than any spring roll I’ve ever seen. Talk about bang for your buck. There are several food carts which offer the beloved spring role, but I frequent Suki’s cart the most. It’s the bright green one that says “Fresh Cool Drinks”. Seeing her is always a pick me up, she knows her regulars and always has a smile on her face. Sprolls are so good that they are literally a topic of conversation when I’m home from school. I crave them like no other. I know, I know. This last point threw you for a loop. It’s cheap, delicious, AND healthy? This crunchy wrap has fresh veggies, avocado and plenty of protein. If rice noodles aren’t your thing, Suki will gladly nix them. So there you have it, the perfect food option, any way you slice it. But be forewarned: the lines do get pretty long, so try to grab one before noon or after 2pm to skip the wait!